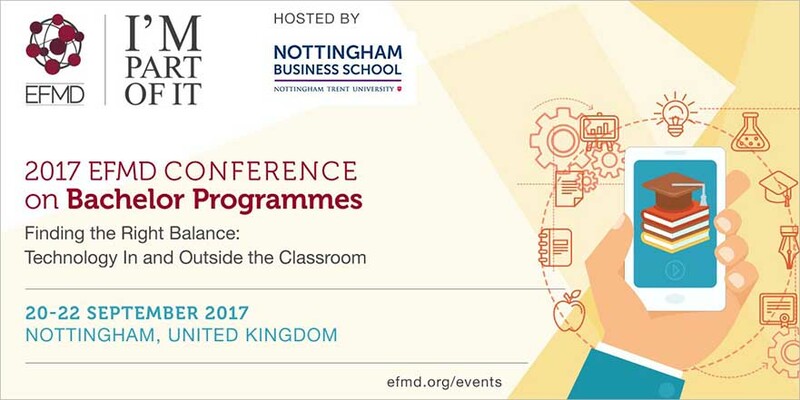 For the first time, EFMD will be delivering a UK-based Bachelors conference and Nottingham Business School, Nottingham Trent University are delighted to be hosting. The European Foundation for Management Development will be leading a series of sessions on Bachelor Programmes across a two day conference at Nottingham Trent University, beginning 20 September 2017. With presentations from BI Norwegian Business School, IE Business School, Madrid, HULT Business School, Sheffield University Management School, SolutionpathEDU and more, following the theme of: Finding the Right Balance: Technology In and Outside the Classroom. The EFMD is an international membership organisation and is Europe's largest network association in the field of management development. Having nearly 900 member organisations from academia, business, public service and consultancy in 86 countries, the EFMD provides a forum for information, research, networking and debate on innovation and best practice in management development. The annual EFMD Bachelors conference has been running for fifteen years and this will be the first time it is hosted by a UK Business School. The conference theme is Finding the Right Balance: Technology In and Outside the Classroom. We look forward to welcoming new and old friends to the School and having the opportunity to share best practices from across the network. The programme has a mix of speakers but also time for discussion, networking and presenting from our participants, which is seen as a valuable part of the EFMD Bachelors Conference. Directors of Bachelor programmes, Associate Deans and Deans in management and related areas will be in attendance at the EFMD ‘Bachelor of Programmes’ Conference, from EFMD member and non-member schools.